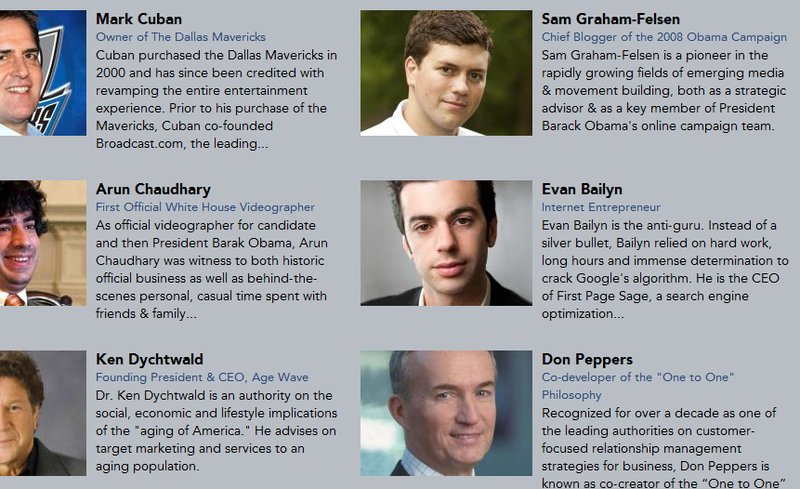 A typical page from a speakers bureau website. The simplicity and convenience of choosing a speaker are evident; but watch for the pitfalls. When you need an excellent speaker for a conference or event, it is tempting to go to one of the many speakers bureaus out there, which present keynote speakers like items on a restaurant menu. Although using a speakers bureau can give you a satisfying feeling of choice, you are paying for that convenience. When I first started speaking, I joined a speakers bureau, and came back from the meeting feeling energized and excited. They had promised to have me speaking weekly, getting paid high honorariums (a fancy word for speakers’ fees, I ascertained). While I was there, I asked them how the process worked. At that point, I had been speaking mostly for free while I gained experience. I learned that they took a fee, usually about 20%, and because of their clout were usually able to get much higher honorariums than I’d be able to get on my own. Since that day, many years back, my speaking career has flourished – but not on account of the speakers bureau. In fact, I haven’t received a single phone call from them. In effect, I believe they were pitching me at way higher prices than a speaker of my experience level warranted, and in the mix, I and the speaking coordinators who were trying to book me both lost out. In other words, the presence of the middle man prevented two parties that would have loved to work together from forming a relationship. Me at a speaking event I had booked directly, without a speakers bureau – as was the case with every speech I’ve ever given. That is how I came to believe strongly in the power of working directly with event organizers, speaking coordinators, and anyone who books speaking for their company. Some of my best business relationships are with these folks, who know they can call upon me when they need me, and not receive a higher price than I personally require simply because of the presence of a third party. Use Google Search. Search for a speaker that covers the subject you specifically require. (e.g. “social media keynote speaker” “magician keynote speaker” “california leadership speaker”) Once you arrive on a speaker’s website, look for signs of the type of person you’d like to speak at your organization: Is the site neat and well designed (if so, the speaker probably will be more “put-together”)? Does the site show evidence of a lot of speaking experience? Are there videos for you to watch so you can see what you will get? Use YouTube. Although many speakers try to prevent speaking videos from going up on YouTube because they aren’t in control of the editing of, or comments associated with, those videos, I believe that the best speakers should be able to handle being videotaped during any speech and have it posted on the Internet. A speaker that has several presentations posted on YouTube, including full stretches of unedited footage, clearly has nothing to hide. They can be trusted; now it’s up to you whether you like their speaking style. 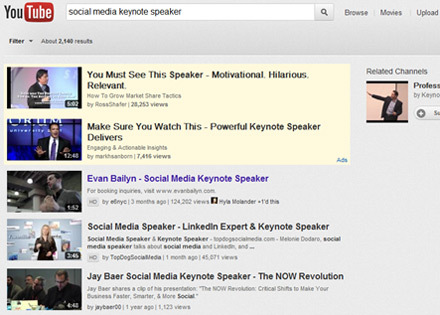 Many people book me by searching Youtube for “social media keynote speaker”. You can search for any kind of keynote speaker and watch videos to find a presentation style that you think is a good fit for your conference or event. Ask Friends and Colleagues Who Have Hired Speakers. It goes without saying that word-of-mouth referrals are invaluable. 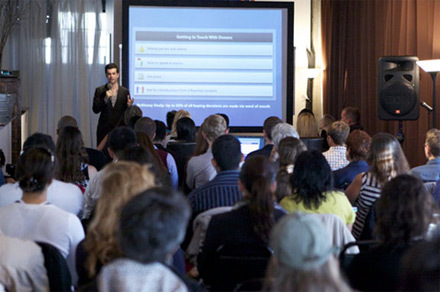 So if you know someone who regularly books speakers, you may get an excellent recommendation. However, always request videos of the speaker (or simply find them on the web) so you can vet them yourself. Those are the reasons I believe in the power of directly connecting with speakers. If you have any other questions or need advice finding a speaker, please feel free to contact me by e-mail. I will never charge you for advice. Good luck!